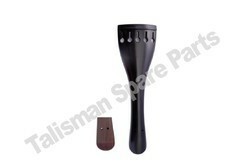 We are offering Bass Tailpiece Regular Style. Available in Bass.Bass Size - 4/4 To 1/2. Aesthetically designed, ourViolin Tail Piece reflects the impeccable craftsmanship and skill in designing musical accessories. Crafted using chemically treated wood, this is known for its durability, termite resistance, finish, polish and intricate & alluring designs. 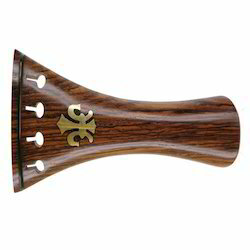 Offered in various designs and colors, this violin tailpiece is widely demanded by our clients across the country. Our organization is indulged in offering Violin Tailpiece French to our clients. These are also available in Sheesham, Boxwood, Tetul and other tropical woods. These are available in different sizes and materials. These are more durable and compatible in nature and also demanded in domestic market. Customers can easily avail this from the market at cheapest prices. Violin part sets, Viola parts are crafted from high quality wood such as such as ebony, boxwood and rosewood. Our complete violin part set comprises of Tailpiece, Chin rest, Pegs, End pins, and Nuts for Violin. Our violin part sets are available in standard sizes. Laying emphasis on finish and design, our range of Violin French Tailpieces are available in different types like black saddle-rosewood, ebony wood and boxwood. These products are known for their sizes and designs. Offered in different models, these violin round tailpieces are widely demanded by our clients. East India Company is engaged in offering an astonishing range of Hill Tailpieces for the violin family. Our product is well renowned for its superior finish, impeccable polish and a large variety of designs and models. Violin tailpieces: Push adjester Hill tailpiece made by Ebony, Rosewood, Boxwood & Tamarindwooden good adjestable & fine tuning well polished and finished to give them a smooth look and finished custom made As per iso specification sizes...Violin, Viola & cello...4/4, 3/4, 1/2....L-8mm, 10mm, 14mm, 15mm availble sizes s per the requirment custom made product. Violin Herp Boxwood Curve Tailpice.